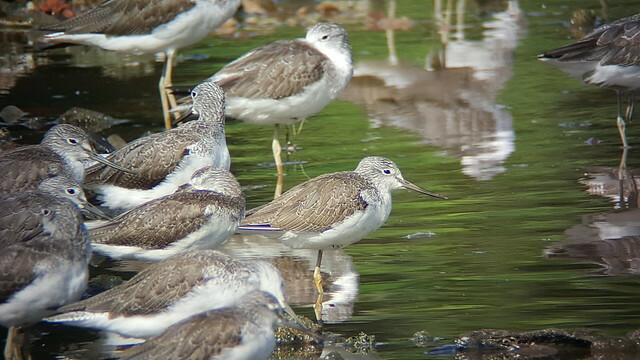 While Changi Airport is well known as an international travel hub, Singapore has long been an important stopover for shorebirds that travel thousands of kilometers every year. 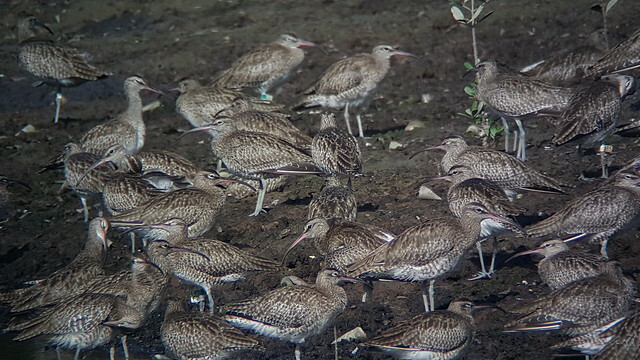 A flock of Whimbrels, check out their long bills! What are these birds and where can we see them? See end of this post for upcoming FREE activities for kids and the family! As their name suggests, shorebirds are mainly found along shorelines and other coastal areas. These migratory birds fly long distances between their breeding and wintering sites each year. And as they are often seen wading in shallow water feeding on worms and shellfish in wetlands and mudflats at low tide, they are also known as waders. Why do shore birds migrate? Many shorebirds breed in the north as far up as the sub-Arctic. While summer in such places is short, it is hot and lush. With the sun overhead almost 24 hours a day, there is an explosion of plants and insects, providing plentiful food. At the same time, the severity of the northern winter means that there are fewer snakes, lizards and other predators that abound in our part of the world. Shorebirds take advantage of this seasonal abundance and relative safety. They arrive in the summer to lay eggs and raise their young. Most shorebirds simply lay their eggs on the ground, not bothering with a nest. The chicks grow rapidly and are able to fly and join the adults on their migration. To escape the harsh winter, the shorebirds fly towards warmer areas in south as autumn approaches. As spring begins, shorebirds journey back northward to their breeding grounds to begin the cycle of life again. 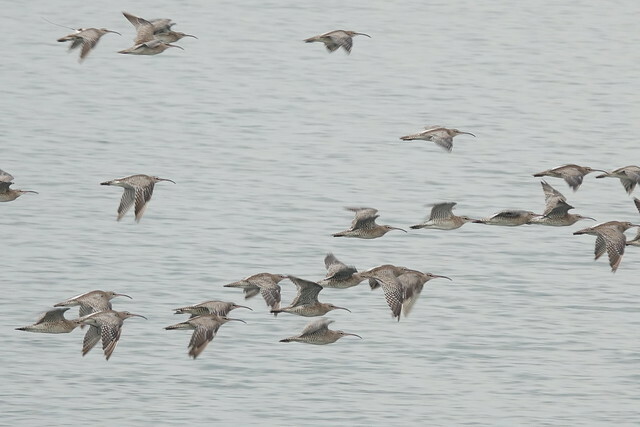 A flock of Whimbrels in flight. How far do shorebirds travel? 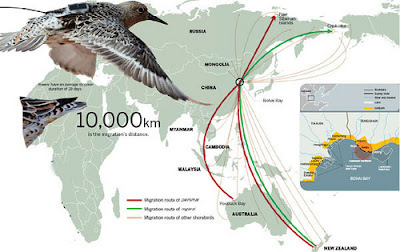 The migratory path of shorebirds can be many thousands of kilometers long, spanning many countries. On their long journey, shorebirds rest and refuel on 'fast food': high-energy food that can be harvested quickly. 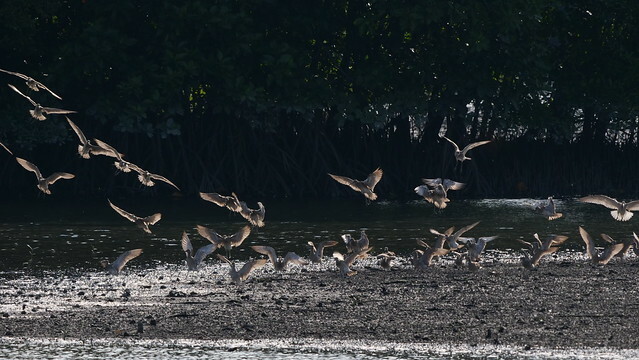 Whimbrels landing on a Singapore mudflat. 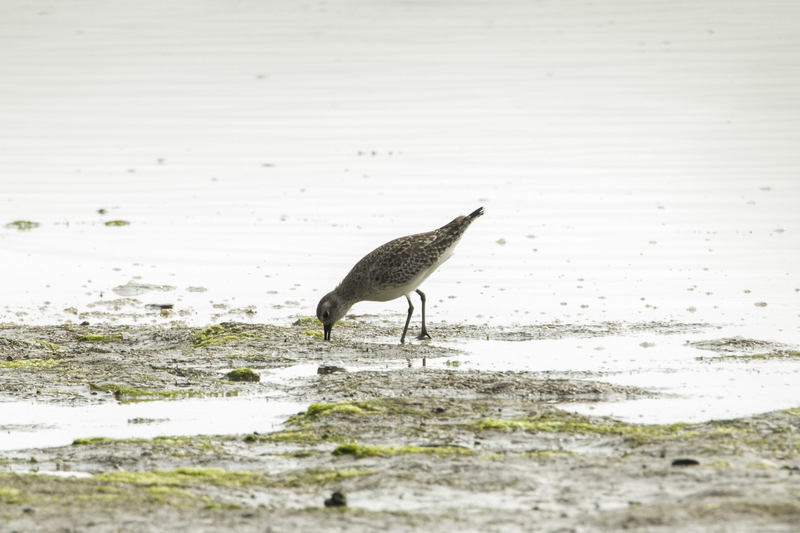 Shorebird food is abundant in mudflats and wetlands. Grey plover feeding on our mudflat. Shorebirds also rest near wetlands. They don't usually perch in trees like many other birds do. 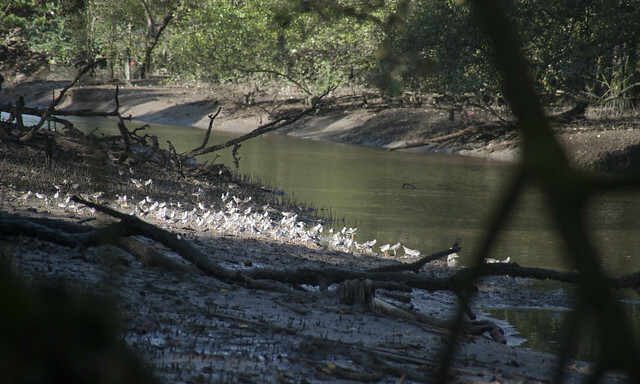 Shorebirds resting on mudflats in Mandai mangroves. Shorebirds not only feed on the shores but also give back to the shores. Studies have shown that shorebird poop helps seagrasses to grow, and in the process heal damaged seagrass meadows. 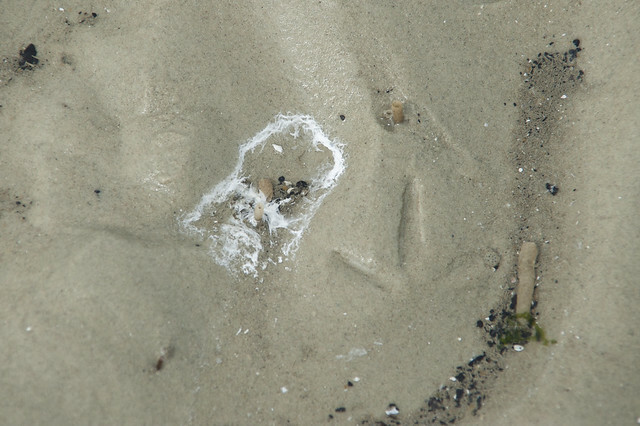 Shorebird poop and footprint on Chek Jawa. 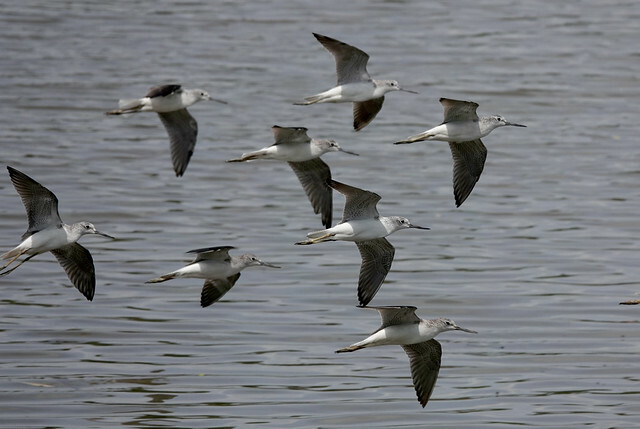 The chain of such wetland stopovers used by shorebirds is called a Flyway. Often, migratory birds must fly non-stop between wetland stopovers as there are no suitable feeding habitats for them in between. The loss of such 'stepping stones' is the biggest threat to the continued existence of these marvellous birds. 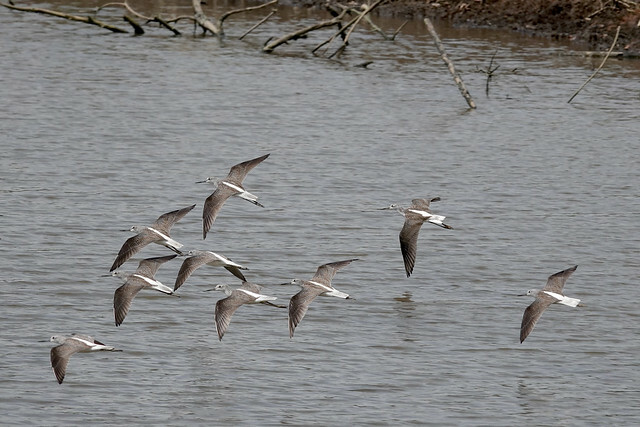 A flock of Common greenshanks. 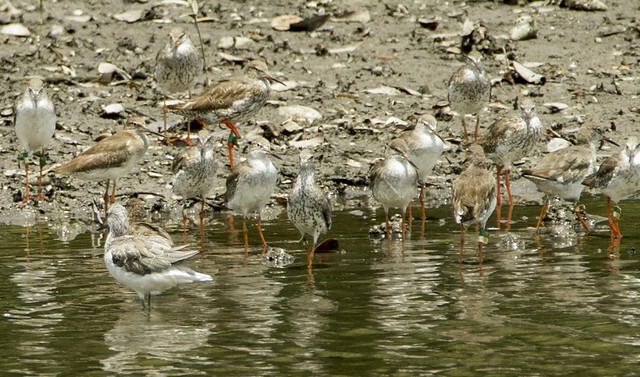 What about the shorebirds that travel through Singapore? 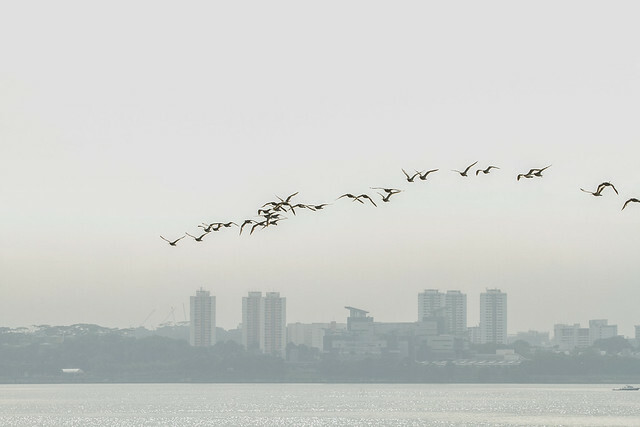 Singapore is part of the East Asian-Australasian Flyway that stretches from Siberia across East Asia, along the Malay Peninsula to western Australia. Just as Changi Airport is a travel hub, Singapore is an important stopover for shorebirds travelling on the East Asian-Australasian Flyway. From the East Asian Australasia Flyway Partnership. 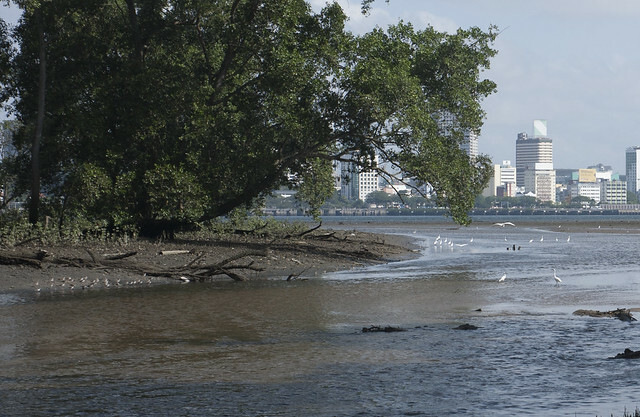 One key feeding and rest stopover in Singapore is Sungei Buloh Wetland Reserve and nearby Kranji and Mandai mudflats. with Johor Baru city on the horizon. What kind of shorebirds visit Singapore? How do we tell apart the different kinds of shorebirds? Many shorebirds look very similar, having a streamlined bullet-shaped body and narrow wings that helps them fly efficiently over long distances. Many also have long legs with large toes to help them walk on soft mud to look for food. 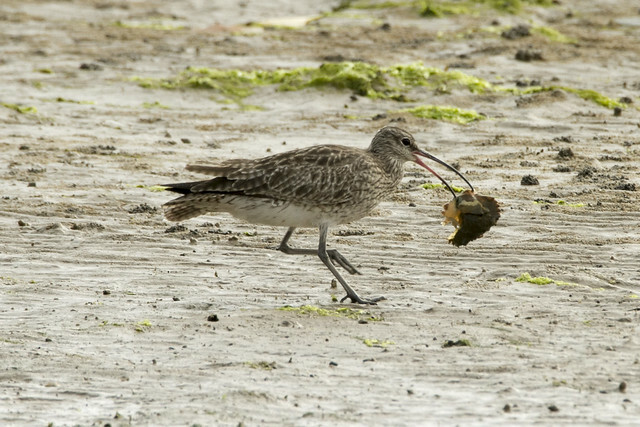 Whimbrel has caught a crab! One way to tell apart shorebirds is the shape of their bills (beak). Some have short bills to pick up animals found at the top of the mud. Others have longer bills to probe deeper in the mud. Some have spectacularly long bills to go really deep. 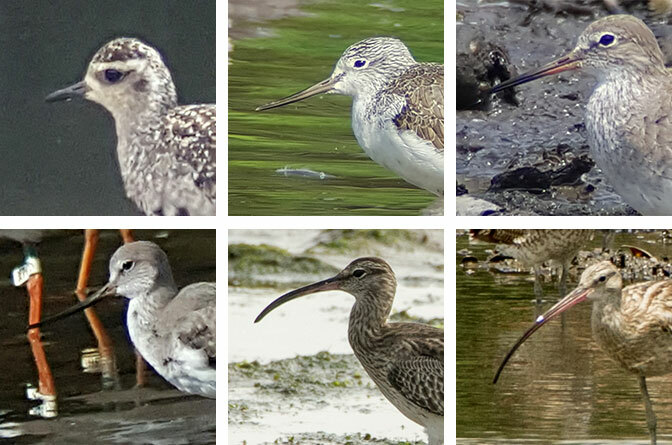 Common redshank, Eurasian curlew, Whimbrel, Terek sandpiper. which it probably snagged with its very long bill. Herons are shorebirds with much longer legs so they can wade in deeper water, and have longer necks and bigger bills to catch swimming prey. 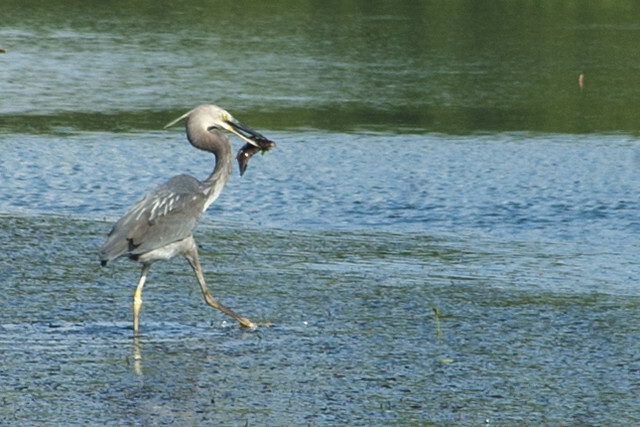 This Great-billed heron has caught a fish! The biggest threat to shorebirds are the loss of wetland stopovers that they rely on for refuelling on their long journeys. Such as pollution of wetlands or reclamation and development. Shorebirds are also hunted in some countries that they pass through. 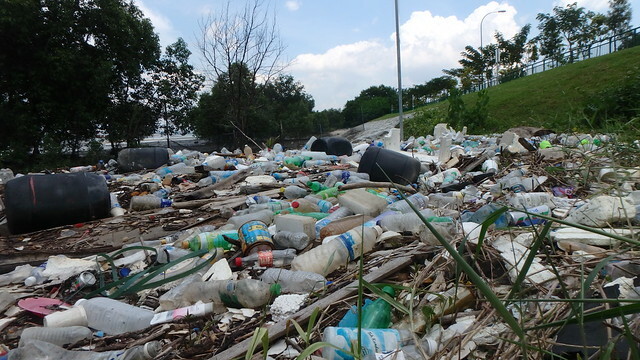 Plastic trash piles up on a Singapore shore. 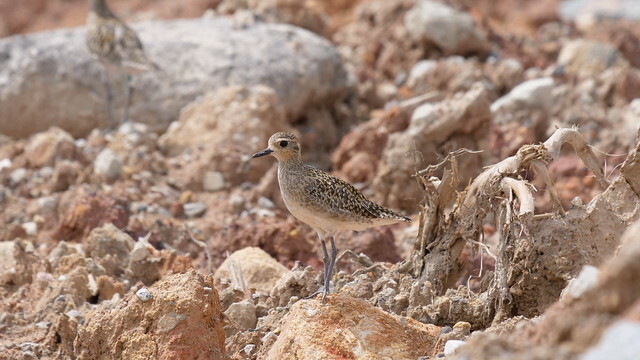 How to see shorebirds in Singapore? It’s easy for ordinary people to observe these fascinating birds! When: late August (when birds start to arrive from the north) to March (when birds start to go northward). 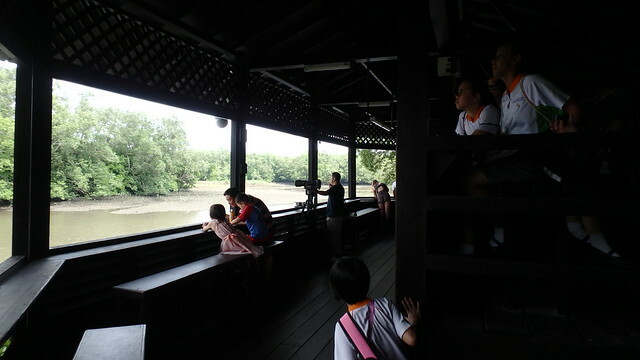 Where: Sungei Buloh Wetland Reserve, from the Main Hide or other stops along Route 1. There are usually more shorebirds roosting at the Reserve during high tide. 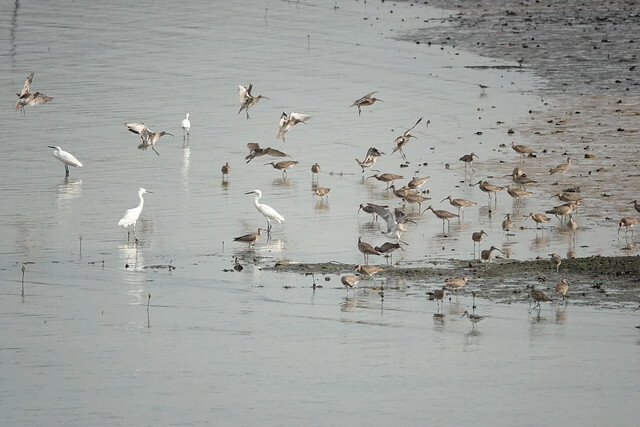 The water in one of the ponds near the Main Hide is always kept low so shorebirds congregate at the Reserve to continue feeding or to rest as other shores are flooded at high tide. 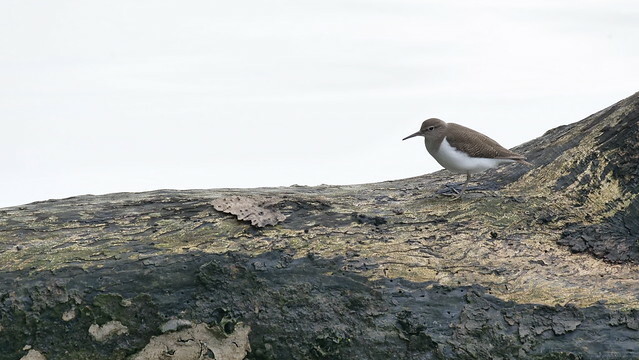 The hides allow you to look at shorebirds without scaring them away. But this means we should be quiet in a hide. On 3-4 Feb, expect lots of activities to celebrate World Wetland Day activities at Sungei Buloh Wetland Reserve! Regular birdwatching tours are also held every month. Check out the latest details by NParks. in the Reserve: like the crocodile! For children 4-12 years old. 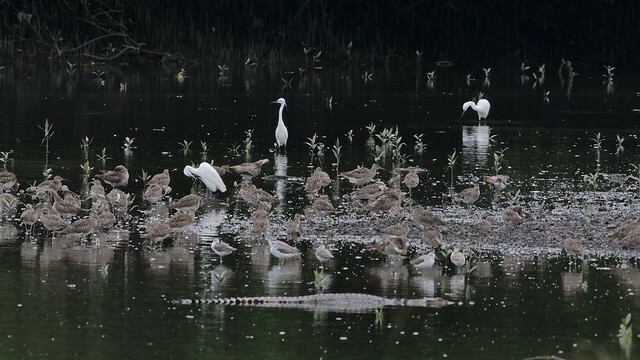 Join Raghav Narayanswamy, a promising young birder, as he shows us the wading birds at his favourite patch in Sungei Buloh Wetland Reserve. Together with his mum Subha, Raghav has been capturing birds with his trusty camera since he started birding a few years ago. He photographed the rare Cotton Pygmy Goose at Kranji Marsh on one occasion. Perhaps we might get lucky and see a rare bird too. More details by the Nature Society (Singapore). 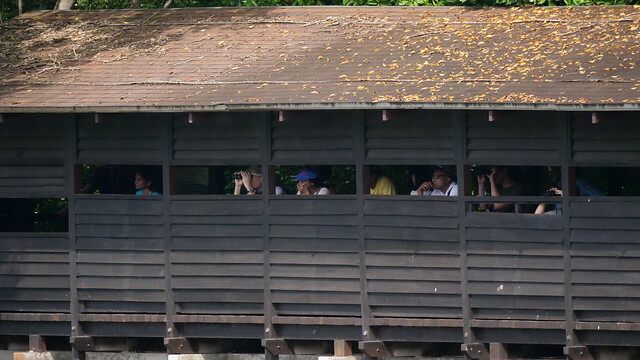 Spot these Seven Migratory Birds at Sungei Buloh Wetland Reserve! on My Green Space, NParks magazine. Shorebirds and seabirds on wildsingapore. 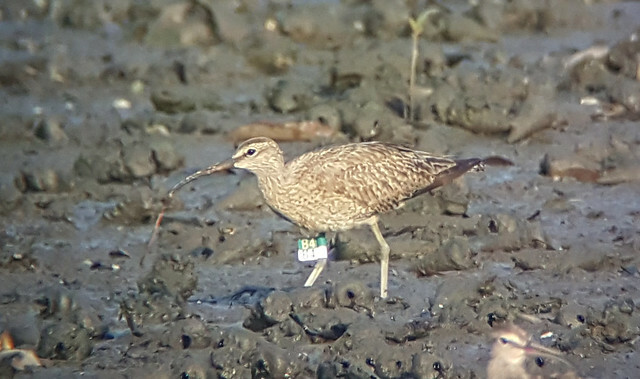 Bird poop helps heal seagrass damage on the wild shores of singapore blog. Share YOUR shorebird stories. We would love to hear about it!